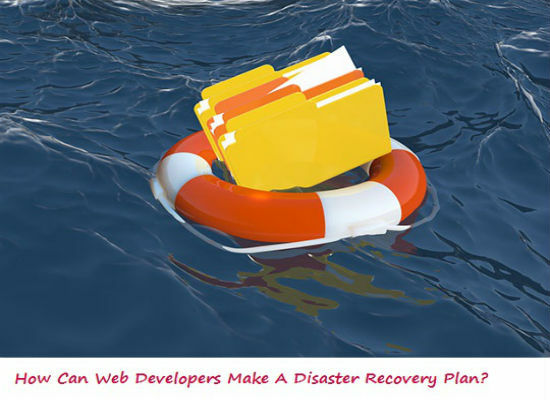 How Can Web Developers Make A Disaster Recovery Plan? If you are a developer, you probably might not have spent a lot of time thinking about your personal disaster recovery plan. Yes you heard it right! Having a personal disaster recovery plan is important for developers! You might have heard about big corporations planning for disasters; disaster recovery planning is applicable to you as well. In today’s world where there is terrorism, hacking attempts, natural calamities, burnouts etc. it is better to be on a safer side with a solution in hand. You might be thinking what disaster recovery planning has to do with web development….right? Read on and you will know how important it is for you. Also think that the other computer among the three PCs might consist of all the pictures that you have taken over the years with your digital camera. This PC also contains your personal tax documents, copies of old websites, your favorite music and other data that you don’t want to lose at any cost. It is important to have a backup system for your computers, so that if you lose power because of any problem then you won’t lose any data archive or the data that you are currently working on. The minimum requirement is that you need your computers to stay up at least for five minutes so that you can properly shut down all the running programs. For this, you will need a UPS (Universal Power Supply) for every computer. This system should have some fairly large batteries for fulfilling all the needs. You will get many UPS options in the market, select one that is capable of taking the load of your computers or your setup and in case of emergency, allows your computers / laptops to be on for minimum of five minutes. You will not regret the purchase of a UPS. The next step is to backup your system’s data on a regular basis, so in case your data becomes corrupted or if your hard drive fails, you have the backup and your data is not lost. The first step is to enable the system restore option. The second thing that you should be doing is to take nightly backups of your data with the use of softwares like ‘NovaBACKUF’, if you know some other software for backup, use them. In this way even if your office is flooded and your computers are destroyed, you will still have your data available on a CD or DVD. There are many backup tools available online like Acronis Backup and Recovery, NTI Backup Now, Paragon Backup & Recovery and Rebit. The main thing that you have to keep in mind is that if you take the backup to a CD or a DVD, then make sure to keep the CD/DVD at a different location than that of your work setup. If you are not using any kind of backup software for backing up your important data, the least you can do is create a CD or a DVD containing all your important files in it including your latest web development work, web designs, business contracts, tax info etc. therefore, even if the worst thing happens to your computers, you will still have your data later through another computer. Lastly, if you are working on a laptop, it is important to have some way to power the laptop in case the power stays out for more than an hour or two. This can be done with a small sineware inverter. This device is extremely efficient and you will be able to power your laptop or computer for hours with it. Until you get the power supply back or until you get to any safe location for working, you will be able to go work with the help of this inverter. Along with all the solutions mentioned above, it is also important to have strong and complicated passwords for accessing your machines and it is also important to change your passwords at regular times. Changing your passwords is the ultimate rule to internet security. I understand that having an easy password helps you in remembering it but it also makes your data vulnerable to the hackers. No doubt the internet world is full of opportunities, but it has its own drawbacks as well. If you implement all the information mentioned above along with the habit of having strong passwords and changing them regularly, then you can say that your work is completely protected from any kind of disasters. Web development is an extremely creative and beautiful work to do. You can be on a safer side with some precautions. All you have to do is spend some time in creating your own disaster recovery plan. It might be tedious for you now, but in case any disaster occurs, you will be thankful that you had a disaster recovery plan and none of your data or important files was lost. Next story The Simplest Way To Create An Education Website : Moodle! Previous story Is Your Website Design Scaring People Away?